“This Is My Father’s World,” hymn no. 293, is the opening hymn. None of the biographies revealed how he died, but I discovered it by looking up the newspapers of the day. It was a suicide. He developed “Mediterranean fever” while on a homeward voyage from Constantinople after visiting the Holy Land. On 08 May 1901, his group reached Naples, and he was taken to the International Hospital there, suffering from “neurasthenia and gastric fever.” He became “much depressed in spirits” and was, at times, delirious. On 18 May 1901, he “was seized with an acute attack of mania. He locked his door” (he had a private room) and then committed suicide by swallowing corrosive sublimate (used to treat wounds before bandaging) and cutting an artery of his wrist with a knife. The readings are the same readings as for the service of 14 June 2015, except this time, verses 26 through 37 of the ninth chapter of John are omitted. (On 14 June 2015, the gospel reading was the whole ninth chapter.) So I can just copy and paste. Yahweh speaks as directly to Samuel as he did to Moses—not in some mystical way that requires interpretation, but directly and plainly. Yahweh says things to Samuel like, “I am sending you to Jesse in Bethlehem, for I have selected a king for myself from among his sons. Fill your horn with olive oil and go!” “And take a heifer with you,” etc., etc., “You will anoint for me the one I point out to you,” –very conversational for the Creator of the universe. In this story, Samuel has to figure out which of Jesse’s eight sons is to be the next King. Yahweh tells Samuel not to be impressed by a guy’s height. After going through the seven older sons, Jesse has only one son left, the youngest one who is out tending the flock. The gospel lesson is John 9:1-25, 38-41. It starts with Jesus and the disciples coming across a blind man, and the disciples wanting to know whether this man is blind because of the sins of his parents or because of his own sins. 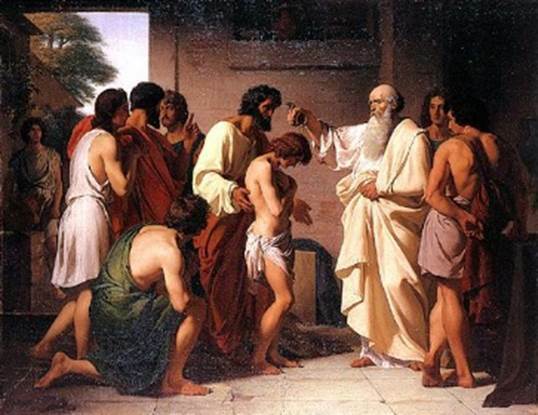 Jesus replies, “Neither.” Jesus says this man has experienced a lifetime of blindness in order that “the acts of God may be revealed.” (One would almost prefer that the man was blind due to sin rather than it somehow being a part of God’s lesson plan so that God might teach humans something.) Anyway, Jesus only needs a little dirt and spit to cure the blind man (which the blind man was then instructed to wash off in the pool of Siloam). The dirt and spit also seems odd. 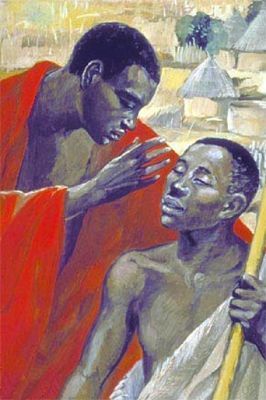 Couldn’t Jesus have cured the blind man simply by just touching the man’s eyelids with his fingers, and it would also have been more sanitary. However, it was important that Jesus actually do something physical in order to teach the next part of the lesson. Because Jesus took some dirt and spit on it to make mud and then put the mud on the blind man’s eyes, Jesus got into trouble as that meant he had been working on the Sabbath. The Fourth Commandment Is the longest of the ten commandments (Exodus 20:8-11). Remember the Sabbath day to set it apart as holy. For six days you may labor and do all your work, but the seventh day is a Sabbath to the Lord your God; on it you shall not do any work, you, or your son, or your daughter, or your male servant, or your female servant, or your cattle, or the resident foreigner who is in your gates. For in six days the Lord made the heavens and the earth and the sea and all that is in them, and he rested on the seventh day; therefore the Lord blessed the Sabbath day and set it apart as holy. Strict obedience to God’s laws was very important to the Pharisees because they believed that the kingdom of God would never come upon the earth until a moment arrived when every Jew was acting in obedience to every one of God’s laws. So disobedience was frustrating the arrival of the Kingdom. The second hymn is “Open My Eyes that I May See,” no 324. The words and music are by Clara H. (Fiske) Scott. The tune was composed by Clara H. Fiske Scott, who died at age 55 on June 21, 1897, in Dubuque, Iowa, when she was thrown from a buggy by a runaway horse. She is also the author of the words of the hymn. Her book of anthems, the Royal Anthem Book, was the first book of anthems by a woman ever published. It was published in 1882. Clara Fiske was born on December 3, 1841, in Elk Grove, Illinois. She studied music at the Music Institute in Chicago, then she taught music at the Ladies Seminary in Lyons, Iowa. In 1861 she married Henry Clay Scott. Sermon: "Seeing the 'Wow' "
The closing hymn is “Amazing Grace, How Sweet the Sound,” hymn no. 280. 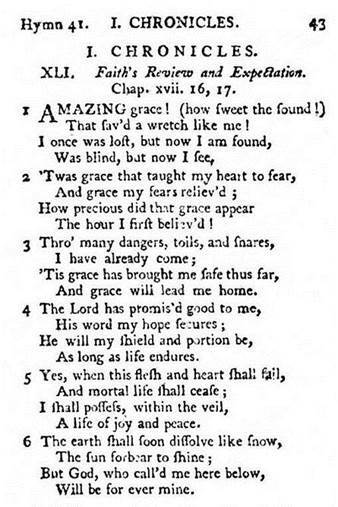 The first four verses of “Amazing Grace” were authored by John Newton (1725-1807, England). The fifth verse is often attributed to John Rees (1828-1900, USA), but that attribution is incorrect. The 1990 blue Presbyterian Hymnal doesn’t attribute that verse to anyone. This verse appeared in Harriet Beecher Stowe’s Uncle Tom’s Cabin, Or, Life Among the Lowly (1852). For reasons unknown, Harriet Beecher Stowe tacked it onto the end of “Amazing Grace” when she has Uncle Tom singing the hymn in her novel. 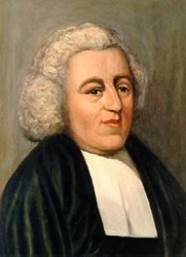 We can be sure it wasn’t John P. Rees who wrote it, as I found that verse in Divine Hymns, or Spiritual Songs; for the Use of Religious Assemblies and Private Christians: Being a Collection by Joshua Smith, Samson Occum, and Others, published in Wilkesbarre, Pennsylvania, in 1802. I also find an edition published in Portland in 1803, and a “Sixth Edition—Greatly Improved” published in Albany, New York, in 1804. John Rees wasn’t born until 1828, so he certainly didn’t write the verse. 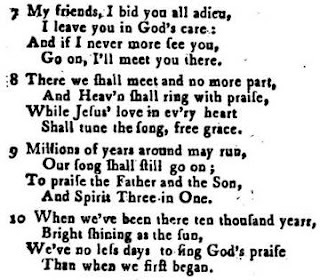 It’s verse 10 of a hymn entitled “The Heavenly Jerusalem.” Here are verses 7 through 10 of this hymn, which begins “Jerusalem, my happy home, O how I long for thee!” from the 1803 hymnal. 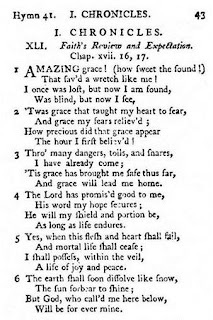 There were more than twenty different tunes used as a setting for “Amazing Grace” before 1835. In 1835, William Walker joined the words with a tune called NEW BRITAIN. NEW BRITAIN was itself a combination of two other tunes GALLAHER and ST. MARY, which were first published in 1829, but have no known authors. Newton’s words first appear with the tune NEW BRITAIN in 1847. They were published together in Walker’s shape-note tunebook Southern Harmony. 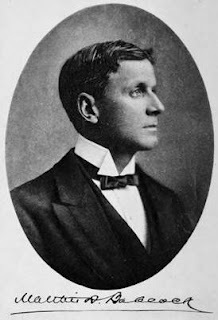 The Southern Harmony version was considered a bit rustic, so Professor Edwin Othello Excell produced a more cultivated arrangement of NEW BRITAIN in 1900 which is the tune that appears in the hymnal. I found a video of the massed pipe bands performing “Amazing Grace” at the West Point Military Tattoo, but the audio wasn’t very good. John and I once played at the West Point Military Tattoo. (I have the T-shirt to prove it.) I don’t recall whether we played “Amazing Grace” though. I was going to put in a link to a version by one of the steel drum bands on YouTube, but I didn’t find any that were especially appealing. http://youtu.be/s6WHuZOesrs “Toccata Festiva,” played by Marko Hakanpää at the Grönlund organ of St. Michael's Church in Turku, Finland. Other than his being a 20th century American, for a long while I couldn’t find any biographical information on Franklin Ritter either. I discovered many of his compositions were published by Lorenz. One source said he was born in 1934. I began to suspect that “Franklin Ritter” was a pseudonym, and it was. 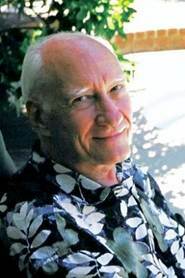 Lani Smith died on 24 Jun 2015 in Tucson, Arizona, where he lived with his wife of thirty-five years. Even in semi-retirement, he wrote several arrangements for organ every week. He was born in Cincinnati, Ohio, on 09 Jun 1934. Lani Smith earned Bachelor and Master degrees in composition from the College-Conservatory of Music of the University of Cincinnati. From 1967 to 1982 Mr. Smith was a member of the editorial staff of the Lorenz Publishing Company, serving as editor of several choral and organ magazines. 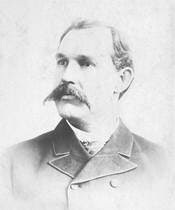 Throughout his career, Mr. Smith also served churches in Ohio, Michigan, and California as an organist and choir director. Mr. Smith composed and arranged thousands of organ, choral, and piano pieces, as well as over 30 cantatas, special worship services, and youth cantatas. While known primarily for his sacred music, he was equally at home in any musical genre, including rock, pop, jazz, and classical contemporary. He made many musical contributions in the secular field, including works for orchestra, chamber ensembles, solo voice, ballet, and musical theater. Commissions from various musical organizations, including the Cincinnati Symphony Orchestra, were received by Lani and many awards came his way, including an annual ASCAP award in recognition of his compositions efforts and the Bearns Prize in Composition awarded through Columbia University. He was also the recipient of a Rockefeller Foundation grant. 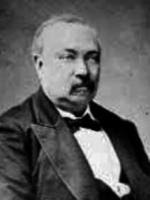 Édouard Batiste was born on 28 Mar 1820 in Paris. He was a composer and organist. In 1840, he won the Prix de Rome. He was the organist at Saint-Nicolas-des-Champs in Paris from 1842 to 1854, then he was organist at Saint-Eustache Church. When Hector Belioz premiered his Te Deum, April 1855, Édouard Batiste was the organist. Batiste died in Paris at age 56 on 09 Nov 1876. The postlude is "March Pontificale" by William Stickles.